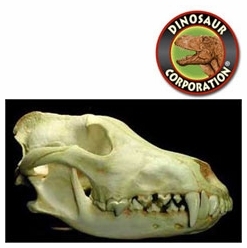 Canidae skulls are museum quality replicas cast from original specimens in durable polyurethane resin. Canidae, Coyote, Dog, Jackal, Fox, Wolf. The Canidae family is a part of the order Carnivora within the mammals (Class Mammalia). Members of the family are called canids and include dogs, wolves, foxes, coyotes, dingoes, jackals, and lycaons. The Canidae family is divided into the "true dogs" (or canines) of the tribe Canini and the "foxes" of the tribe Vulpini. Canids have a long evolutionary history. In the Eocene, about 50 million years ago, the carnivorans split into two lineages, the caniforms (dog-like) and feliforms (cat-like). By the Oligocene, some ten million years later, the first proper canids had appeared and the family had split into three subfamilies, Hesperocyoninae, Borophaginae, and Caninae. Only the last of these has survived until the present day.